We had postponed a decision on our final route until this point. We knew how the trip would begin and end, but days four and five had several alternatives. 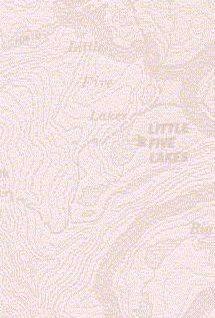 Would we head x-c toward McGee Lakes from Evolution Valley? If so, would we pack x-c from McGee over to Sapphire Lake or backtrack to Colby Meadow? 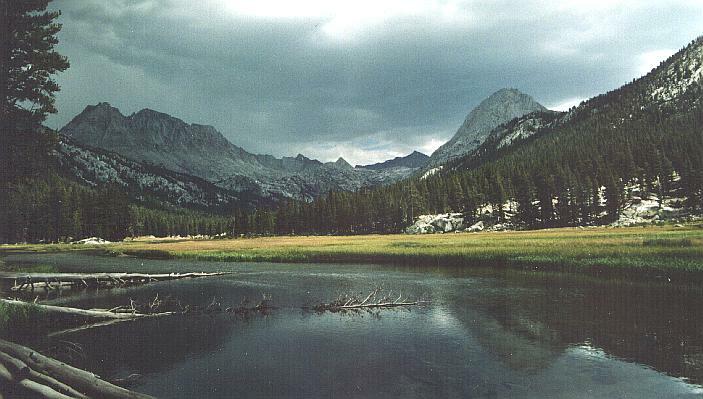 Or would we forego those opportunities and continue on the Muir Trail? My two-day fishing permit began today, so the lakes were appealing but certainly not the only fishing-hole in the area. With all that in mind, we returned to the Goddard Canyon bridge, crossed over the South Fork, and ascended into the stunning gorge of lower Evolution Creek. The first stretch was warm and quiet, with great views up and down Goddard Canyon framed by large mountain hemlock trees. 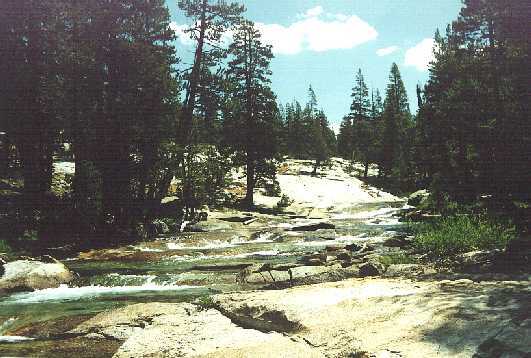 Crossing a slight crest, the roar of the creek took over, and the great cascades showed their persistence by the great cavities carved into the hard granite. Each bend in the trail brought new waterfalls into view, and no one falls was superior in its beauty. My favorite stretch, however, was the creek just above the falls, where the stream stepped down foot-high drops and whose gentle murmur was muted by the roar from lower down. In a short while we were at the ford, which was not quite knee-deep at the time. The darkening skies suggested that the level might be rising later in the day, and soon a single clap of thunder echoed off the valley walls as we passed Evolution Meadow. The clouds thickened further, but that single rumble was as close to stormy weather we encountered. I've noted on past trips that 10AM is the make-or-break point for Sierra rain. If cumulus clouds aren't building by then they rarely produce rain, and these had just come in at the wire. We met the local ranger at the next stock fence; he reassured us that the forecast was for improving but cooler weather. Since Lamarck Col was tough enough in good weather, this was very good news! We soon reached the ranger station at McClure Meadow . The view from the meadow was as just as advertised - spectacular shades of green contrasted against the pale grey of the Evolution Peaks and the darker shades of the clouds. Many small trout darted in the still waters of the creek, and silver snags added yet another shade of grey as they lay in the quiet stream. Julie was running out of steam, victimized by her head-cold; Larry suggested I move ahead and scout out a camp. My first stop was near Colby Meadow, and the site held great promise until I heard the shout from nearby. I looked across the stream and straight into another camp, where someone was taking a solar-shower; the privacy of this site was clearly compromised! I moved on a little further, but now Evolution Creek was quite a distance from the trail. I waited until we were all together again, then we dropped our packs and searched for a decent site. Larry disappeared for quite a while, then returned to us with news of a great spot. After ten minutes of wandering we found it again, set up a nice camp by Evolution Creek, and discussed our options. We decided our best bet was to stay here a second night, giving us a full day of rest before tackling Lamarck Col. It would be a tougher day to cross the col from this lower camp, but the day off would do all of us good. Larry and I tried the stream for fish, and we caught and put back several small ones before returning to camp for more typical camp food. 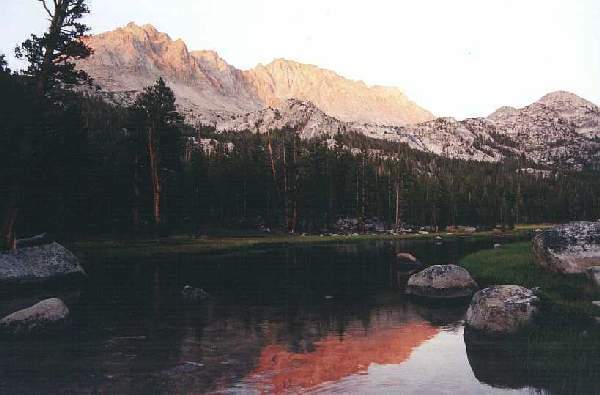 I found it hard to concentrate on fishing here - the massif of Mendel and Darwin dominated the eastern sky, turning an amazing crimson at sunset, and the outflow from Evolution Lake crashed into the valley a short ways off. The good news was that our 9900-foot elevation allowed us to make use of the plentiful downed wood: a pleasant fire contributed nicely to the ambience, and we turned in for a restful sleep.